When we sow the seed of faith, we reap a small sapling that gradually turns into a beautiful tree, giving us the fruit of courage, hope and love. Yet, when we sow the seed of fear, almost overnight, we end up with a jungle of misgivings and hopelessness. In my life, as Captain Rakesh Walia, fear and faith coexisted like no place else. Orphaned at a young age, my life was defined on the floors of factories and the streets where the howling winds of misfortune put me to sleep every night. Tears had dried up and hunger was an everyday thing. Education was not a priority, and ambition was unheard of. Yet, it all changed when I changed. The world remained the same. But something within me changed at the sight of the tricoloured flag. A sense of belonging propelled me into a sense of purpose. Before I knew it, I was questioning every stranger, putting every dime I had into books – how could I get into the Indian Army, my brain constantly asked; my heart constantly desired. The day came when I entered the Academy as a cadet. I looked back and saw the orphaned child labourer bidding me goodbye. When I looked in front, I gulped with fear – would I do justice to this place? I was at bay. I was a sinking ship. I thought I would put this pious place to shame by being the first failure to emerge from its illustrious womb. Yet, this too changed. I began hounding my instructors, looking for a reason to shine. I questioned and found answers until every lesson was sharp as a razor in my mind. And then, began my gradual yet steady climb. With stars on my shoulders, I became a protector to this beautiful country of mine. Now, sitting here in my beautiful office overlooking the verdant greenery of my farmhouse in the outskirts of Delhi, I watch how trees grow and fall. I know it is the fate that will eventually meet us all. Yet, I know I have to stand tall. A report sits on my desk, begging for my attention – just as a lump and a pain in that part of my body had asked me to pause and think. What would I choose now, I asked myself – fear or faith? A surgery awaited me and so did much more. Stay with me on this journey to know more. This is a developing story that is being shared as a blog series by the well known best selling author – Captain Rakesh Walia. And All is covering this true story of the recent cancer scare that he is undergoing. Being the motivational speaker he is, and with a heart of gold, he has decided to blog out this experience and convert it into a book to inspire generations to come. 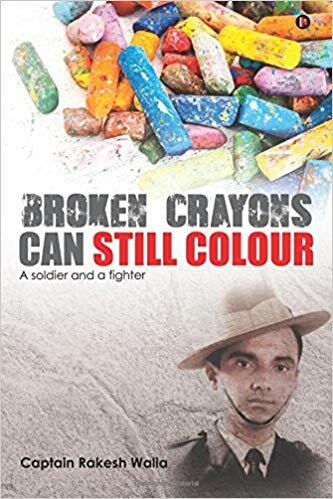 Do buy his first book Broken Crayons Can Still Colour right here! A beautiful story tugging the heart Devangini by Captain Walia on sacrifice for mother India so that we can sleep peacefully. The soldier stands rock solid making sacrificing with whom a family forsake living.